In this placement, we were asked to create a multiple page manual that would be used to allow those with even the most basic tech knowledge to control the equipment in the tech room. 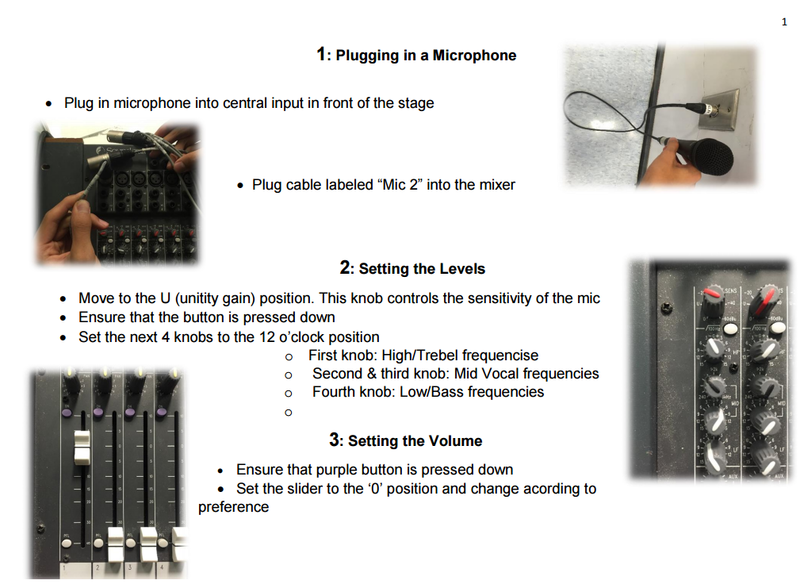 Our final product was a 4 page manual consisting of several components: Setting up the microphone, Speaker output, Main volume, and Lightboard.However, this all started with Mr. Wong's request. When initially talking to Mr. Wong, the main problem he wanted addressed was the complexity of the current tech manual, as well as the lack of tech team members after the current year. 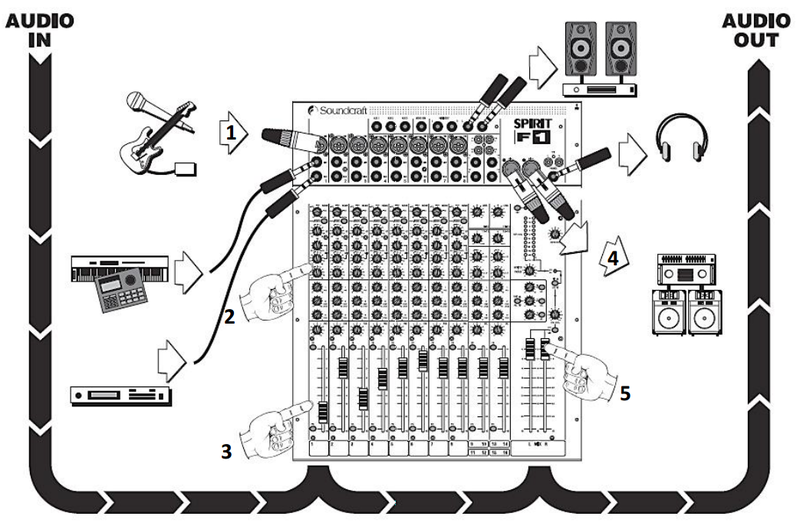 His solution to the problem was to create a simple manual for general assemblies, containing how to set up microphones, plug in specific audio devices, and combine all the equipment in tech room to ensure a smooth and problem-free assembly. The manual we developed contains all the needed instructions, along with helpful photos of what the equipment actually looks like inside out tech room. This will make it extra clear to students using the manual on where they can find different pieces of equipment and how to use them. We also labelled the equipment using tape so that they can not only be identified based on their name but also so that they can be seen better in the manuals. ​However, we still took certain parts from the previous manual, such as a general design of the entire A/V board, because it could not be recreated and still serves a very helpful purpose. By creating this manual, it saved Mr. Wong a lot of trouble and stress. He will no longer have to worry about how the tech room will function in the future, and can heavily reduce the amount of training he would otherwise give to the students. Until newer equipment is put into the tech room, this manual can be used without problems. Furthermore, the manual serves as a very useful template if a new one ever needs to be created, and based on the success of its implementation, it can be altered until even the least technologically weak person can perform a basic assembly. Although the manual was created specifically for use in the tech room, the idea of manuals can be used in other classes. For example, the template of the manual can be taken to create other technological instructions for other classes. 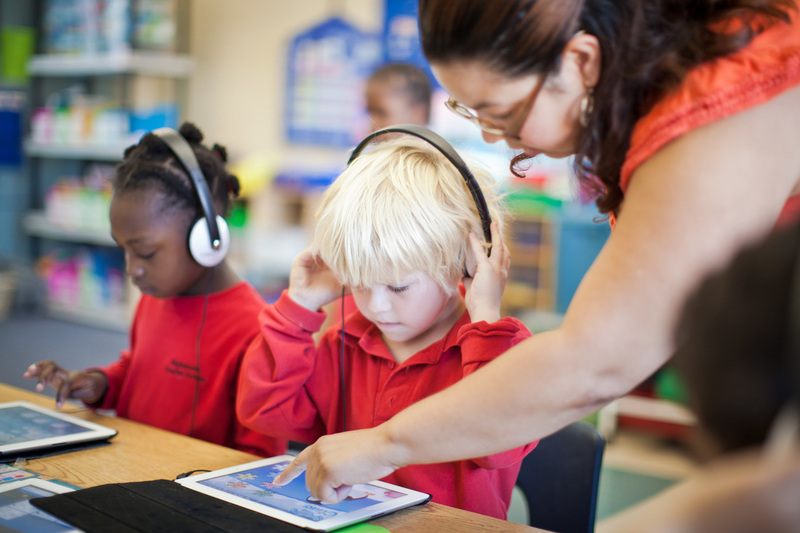 This can include using the Smartboard, projectors, specific website/online technologies. These all have the same general format, with chronological instructions and helpful pictures to communicate the essential information more clearly. Another possible use would be eventually allowing the tech room and equipment to be used by classes for presentations/general use. Since the manual is designed so that those with little A/V knowledge can operate the tech room, this should mean classrooms will know how to use it too. Hopefully classrooms will be able to eventually book the tech room in the same fashion that they book the library, and it can be used for large presentations or whenever lighting/microphones are needed. Both of these are possible, and with enough effort could greatly help the school become more technologically oriented.